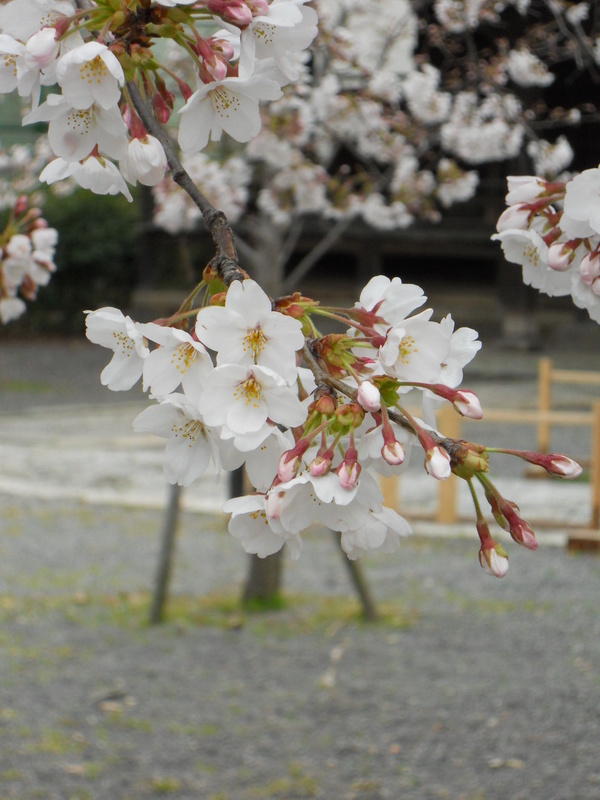 While it was day two of training in Kyoto, it was actually day one for me as I am a day late. For those that followed the last post- yes I did make it. 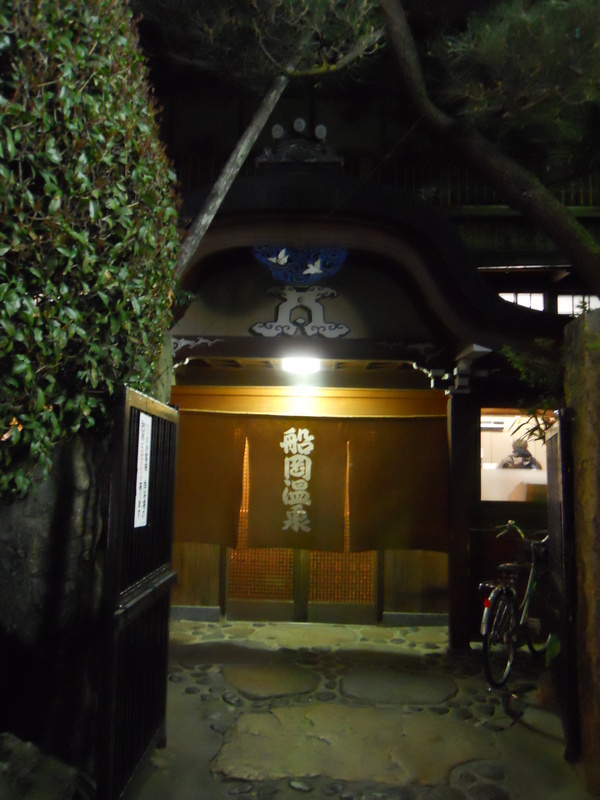 I arrived to the dark side streets of Kyoto to my friend Mark’s home which he graciously lent me while he was away. 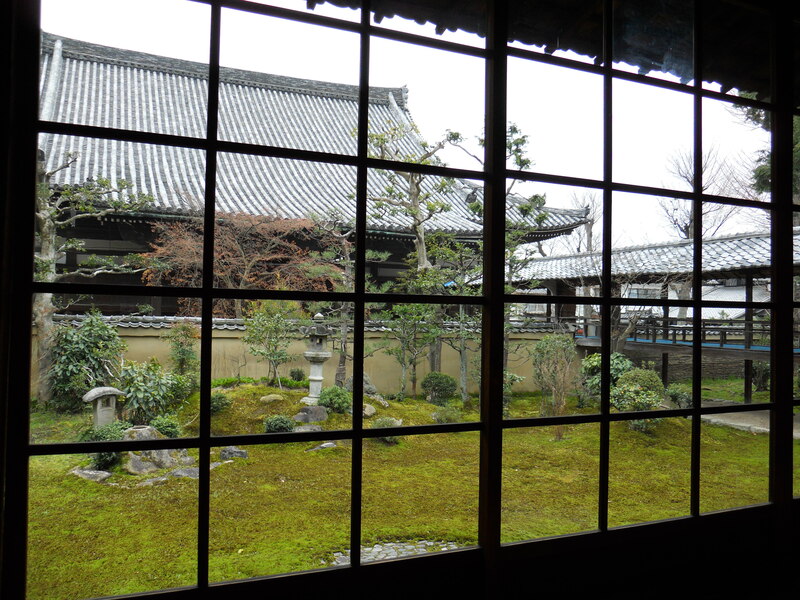 His beautiful home brought back so many memories of the years I spent living in Japan. I realized the only thing I did not miss was lack of central heating. 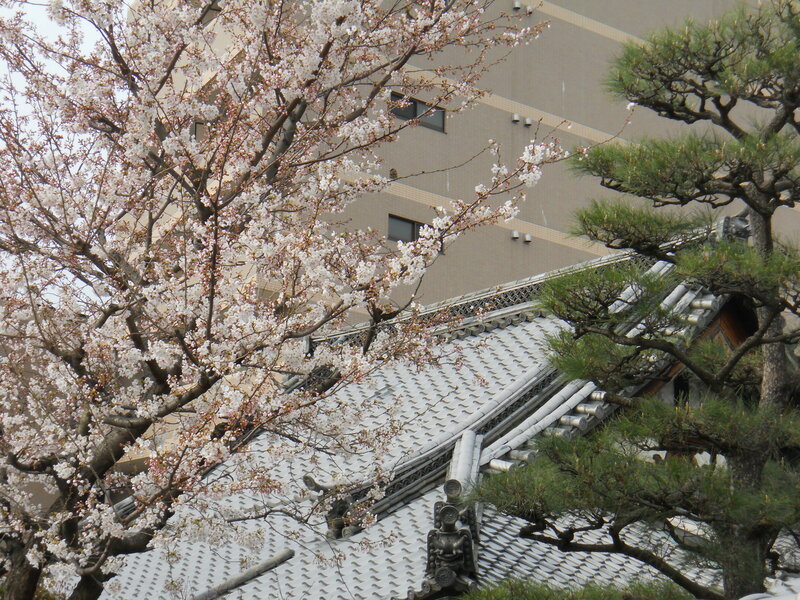 It is so cold in Kyoto that it snowed a few days ago- unbelieveable! I started the morning off early- welcome to the time change- and went on a mission for toast and coffee. I never eat white bread at home but in Japan it just calls to me. As I wandered with a with map in hand and very little idea of where I was going, I noticed that I always seem to be “unlost” in Japan. I have always managed to find my way around here and that is not easy in a country with little old streets and not a ton of signage. 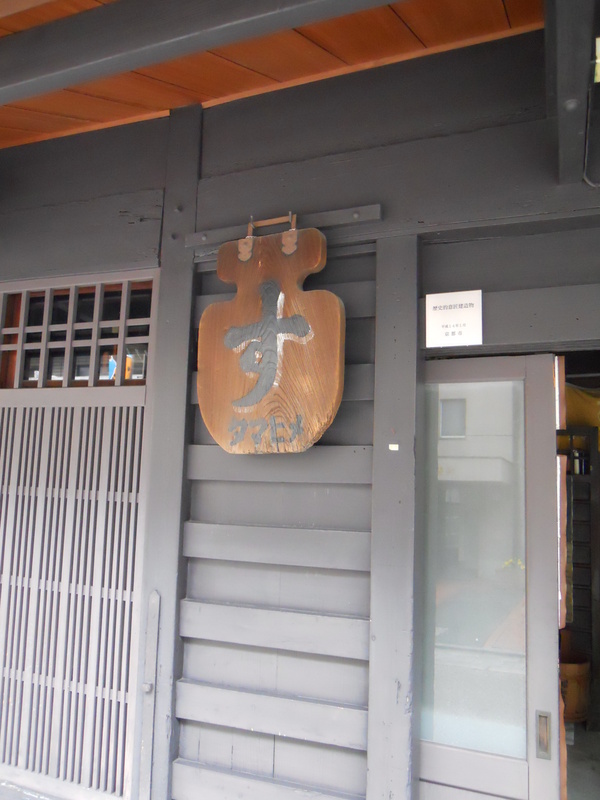 In my wandering I found no coffee at first but a wonderful assortment of temples and shrines. 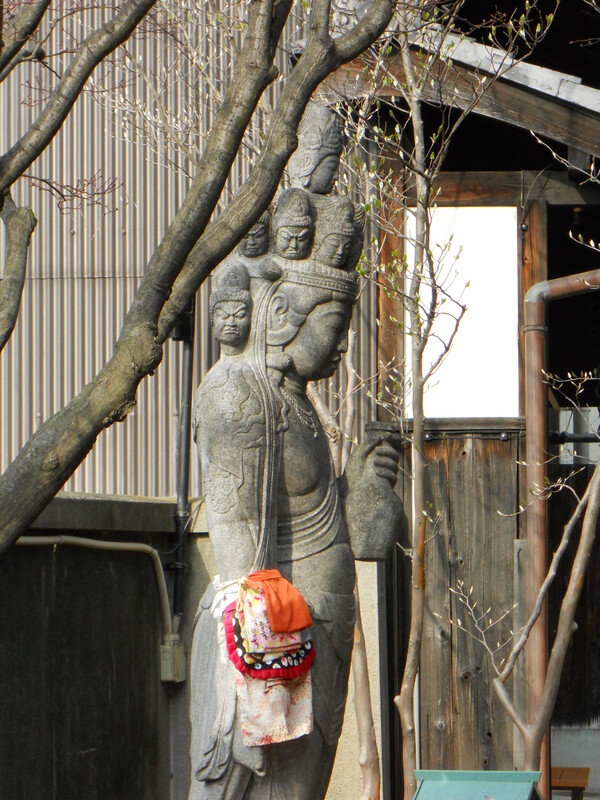 In Kyoto every neighbourhood seems to have an amazing shrine and it is such a treat. 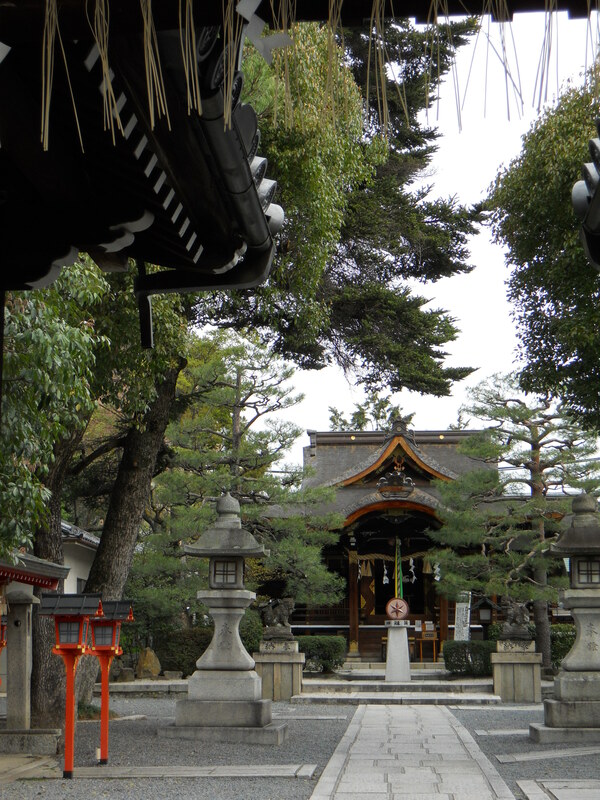 My first temple I stumbled upon was Shakuzoji Temple just off Senbondori. 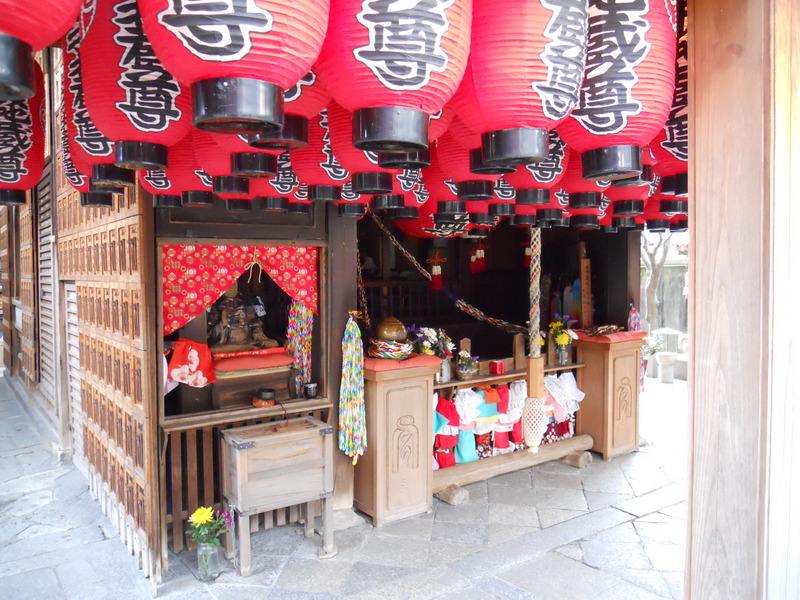 The amount of colour in the temple was so lively with bright red lanterns hung tightly together and the jizo statues all adorned with little bibs. For such a small temple it had a really deep visual impact and I loved it! 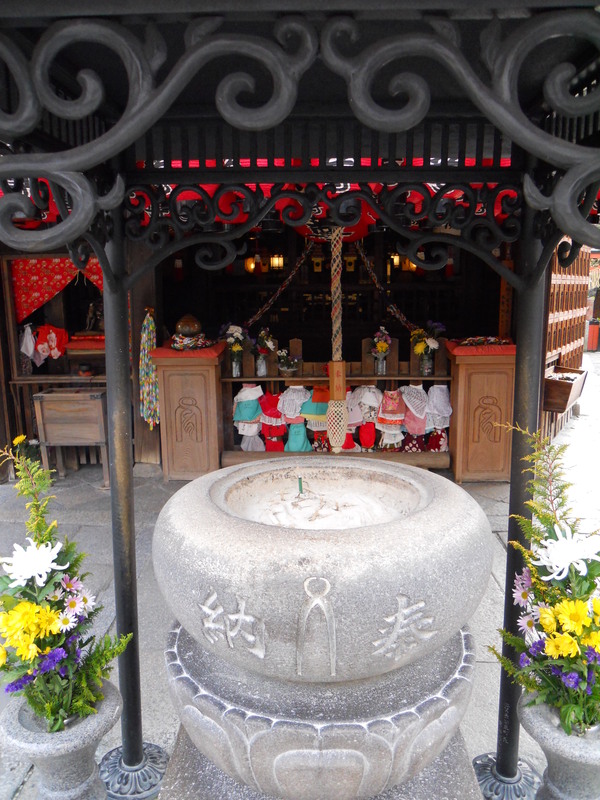 The next shrine was closer to the venue and was called Daishogun Hachijinja. More sedate in colour, the large old trees on the property took you right off the modern street and straight back 300 years. I swear it was so quiet there you forgot you were 50 feet off a main street. After more wandering I finally found a perfect little coffee shop with not too much smoke, and settle in to a delicious cup of coffee brewed the turkish way with fat toast oozing with butter and a boiled egg. Feeling renewed I thought I would wander towards the venue of Ryuhonji temple and wouldn’t you know it one of the larger shrines in Kyoto was right in front of me – Kitano Tenmangu Shrine. Talk about the shakti guiding you! 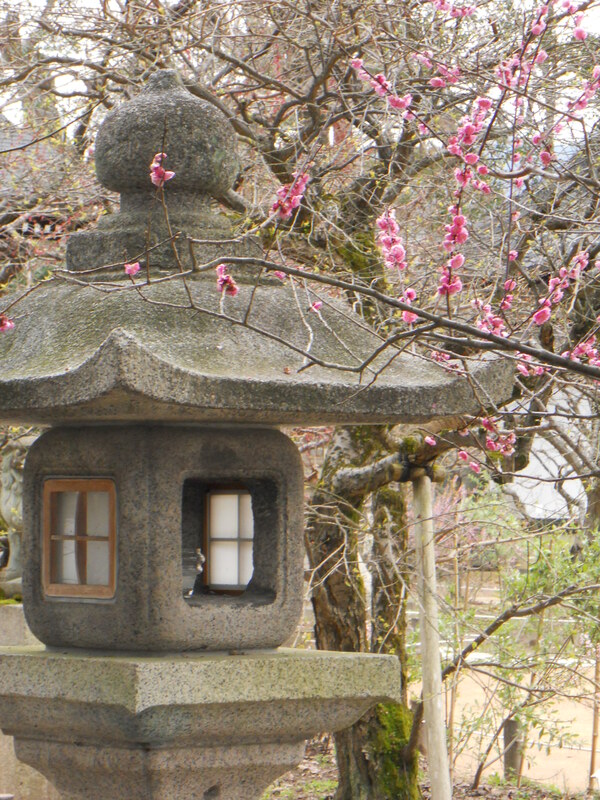 This temple is famous for plum blossoms (ume) and there was one tree in perfect fullness. 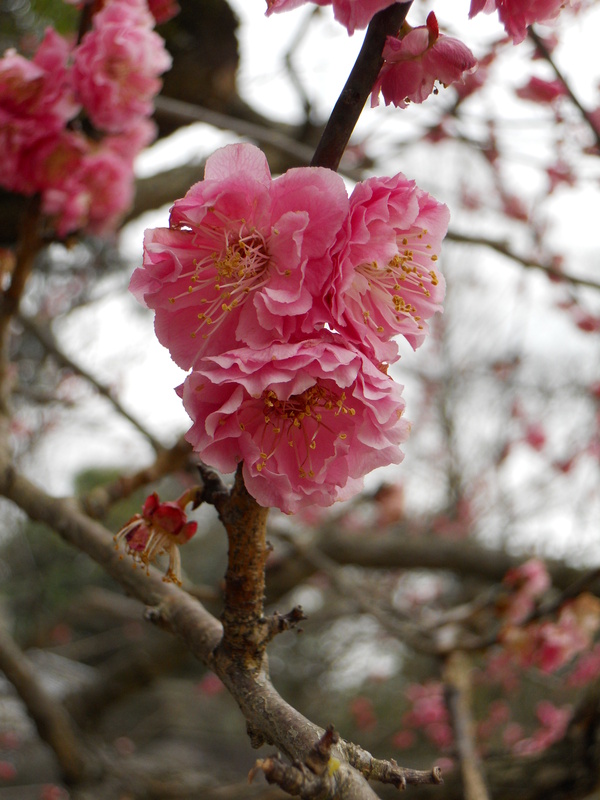 The colour is deeper pink than the sakura ( cherry) and fuller in the amount of petals. 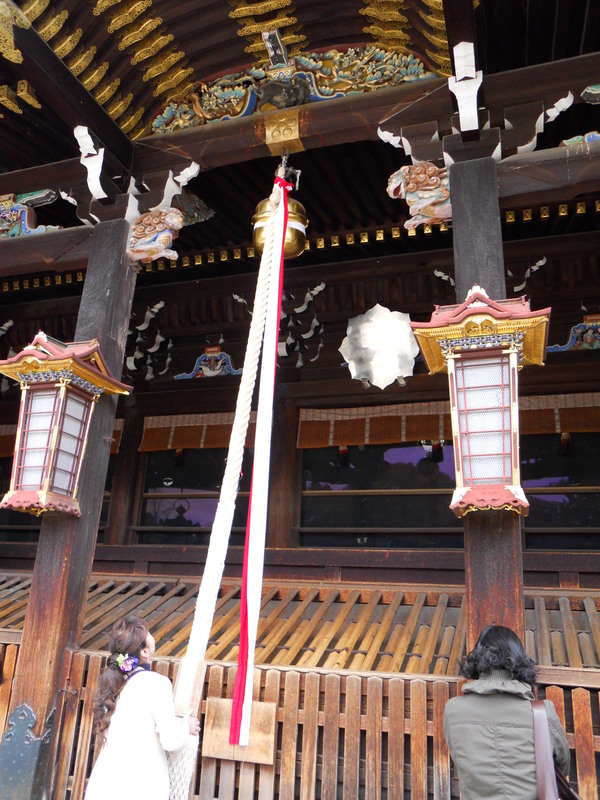 The man hall of the temple has the traditional offering box and gong but there was a plum shaped mirror up above the gong. I realized that if you went to ring the gong you could see yourself in the mirror. There was even another mirror further into the recess of the prayer hall that was reflecting images back. I am not sure what the history was behind it but it was certainly a rare and curious thing. I will have to follow up with more research. I looked at my watch and realized I had actually very little time left to get to the venue so my wandering ended and in 10 minutes I was at the venue. 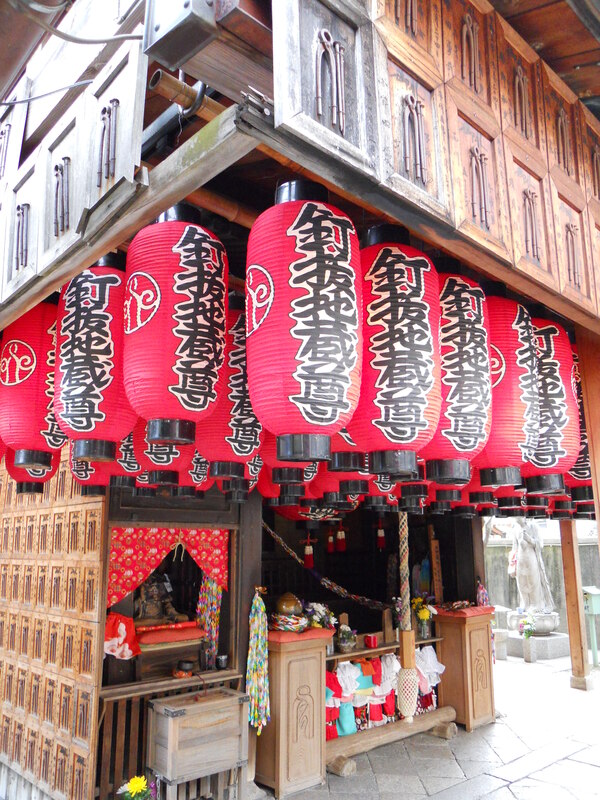 A wonderful traditional temple, Ryuhonji is not open to the public for touring. The hall we used was surrounded by gardens and a small covered walkway to another hall. 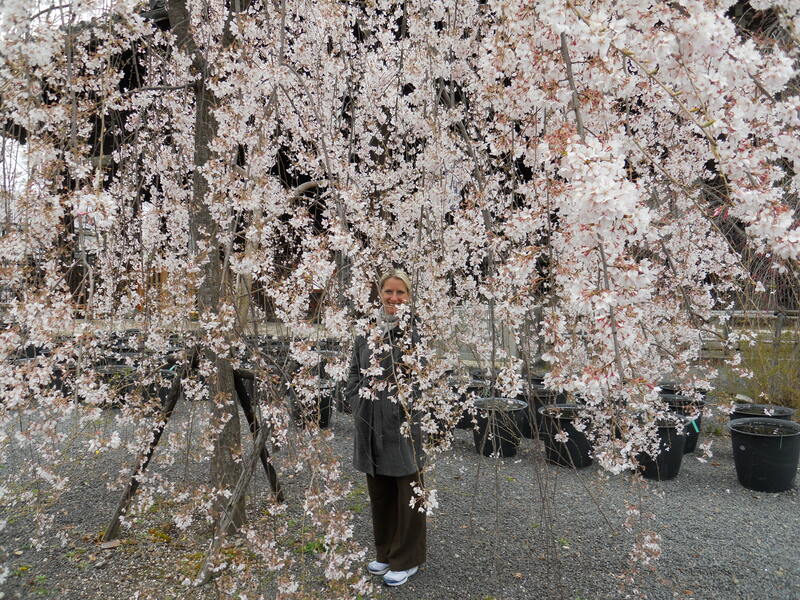 The grounds were full of weeping cherries and one of the girls snapped a shot of me in the cherry blossom shower- so delicate. 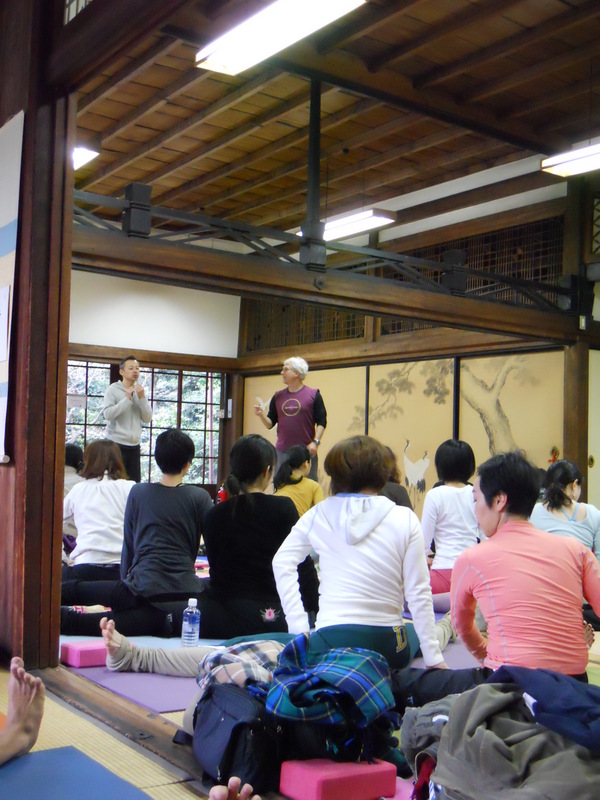 The weather in Kyoto was unusually cold and the hall was unheated so though ” hot or cold should not affect the yogi” it was challenging. I was interested to see how John would present the material because, really, the Gita in a day??? He started the day with a question from one of the students which was ” om namah shivaya guruve” , the Shivaya part- how do I really describe that? I understand but I have no adequate words. John explained that we are trying to describe something beyond words. We are trying to use words from the relative world to describe something that is beyond the relative. Yes- it can feel inadequate. He gave an example how when one says ” good” to describe shiva that our mind thinks “good and bad” we think difference, opposites, contrast- but in the absolute it is beyond opposites and duality. John managed to flow this entry point into an introduction of the Gita. He explained that Krishna is having the same problem with Arjuna and is trying to get him to have an experience of Shiva but that words are not adequate for Arjuna’s understanding. ( This is why you get the shock and awe of Chapter 11…) In the Gita, the characters represent parts of all of us: Krishna is shiva- the teacher within, Arjuna is the individual soul “jiva”, the chariot is the body, the horses are the senses, the reins are the mind, and finally the battlefield is the relative world. John went on to say that you need three things to understand this key scripture. 1) a deep desire to awaken to your own goodness. You need to read many different translations, study and meditate on the text. 2) a teacher. The book is small but the text is very deep- condensed knowledge- and a teacher will help you unfold the layers and reveal the deeper teachings. 3) Grace. Spirit will allow you to understand this text. You must have blessings. In this way the understanding comes from the inside not from your intellect. From here we journeyed to the setting of the Gita, the story of the Mahabarata, and we learned the three paths or “marga” of the Gita. Each path is like an upward spiral or circle. The first 6 chapters focus on Karma yoga, the following 6 on Jnana yoga and the last 6 on Bhakti yoga. John went on to say that we can live the book as a synthesis of all three paths- it doesn’t just have to be one. From here we delved into one of the main teachings of the Gita which is Dharma. In a way, I think the Japanese get this better than westerners. 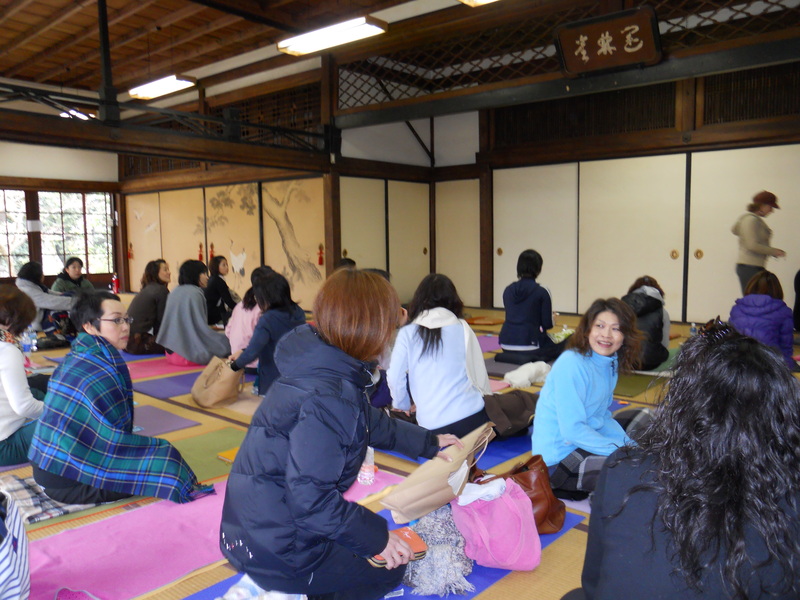 Dharma and swadharma ( individual dharma) are still more active in Japan. John explained you have an individual dharma because of your own karma and you need to act a certain way in your life. You were born into this life for a reason. He emphasised that when he says ” do fully” , you do fully for you– you don’t do it like someone else. Everyone has a talent. “What is your talent?” he asked us- that will help you find your swadharma. We came back in the afternoon to discuss the difference in viewpoints between classical yoga- from which the Gita is written- and the Tantric viewpoint. The classical viewpoint sees the world as two separate things: purusha( spirit) and prakriti ( matter- which also includes emotions and imagination, mind stuff). Classical yoga’s goal was to separate the two so that spirit could reunite with itself after being entangled and misidentified with matter which was considered inferior to spirit. ( ie body bad, ego bad, got to get out of that to get to spirit) This is called a dualistic perspective. In the Gita, specifically chapter 13, this is called the “knower” ( purusha) and the “field” (prakriti). In Tantra, prakriti is just seen has a heavier, slower vibration of spirit. It is not inferior; it is all one energy. This is called a non-dual perspective. I realized why John went over this when we got to the discussion of the gunas. The gunas: Sattva, Rajas, Tamas, are seen very differently in the Gita’s classical perspective than in the Tantric philosophy that informs Anusara Yoga. In classical yoga Sattva is good, Rajas is bad and Tamas..well is just plain awful. In Tantra, sattva is the place of the middle- the middle vibrations, rajas is more active- a higher vibration and tamas is dense- the slowest of the vibrations. You need all three: for example rajas is great in the morning when you have to get things done. You want energy and movement. Tamas is wonderful at night when you want it dark and quiet , heavy so the body can rest. We actually did a practice felling the gunas in the body: back leg in the standing poses tends to be more tamasic so you need to make it more active more rajas ( inner spiral and muscular energy) to bring sattva ( balanced action). I really liked how smoothly John weaved that and how much sense it made in the body. John said even the master gets out of balance but we don’t see it because the know how the balance the gunas more skillfully. We ended the day finding our talents- going back to the discussion of the morning. I really have trouble with this. I always ask myself, “why am I here?” ” Am I doing the right thing?” I am good at a lot of things but not brilliant at any of them..my talent is being a jack of all trades I think! As I sat with this a little longer I looked at my small list and something else popped out. My talent- I think- is sharing. That is why I love to write, that is why I love to teach, that is why I love to travel. I want everyone to share my experience- to see what I have seen, to taste what I have tasted. Even my flying is sharing- I am constantly chatting with the passengers and asking them to share their experiences, giving them helpful information for their travels. This was a big revelation for me. For those that know me maybe you can comment on this- do you think we got it right? Thank you Leanne for sharing this experience. I love your insights and the clear way in which you write about the teachings. From what I know about you I would agree that sharing is definitely your talent.